9x12 inches. Compiled and revised by Robert Cavally. Contents: Arioso and Presto (Quantz); Minuet and Dance of the Blessed Spirits (Gluck); Hungarian Serenade (Joncières/Andraud); Andalouse (Pessard); Andante from Concerto in D minor (Molique); Serenade (Hüe); 2nd Menuet from L'Arlésienne (Bizet); Offertoire, Op. 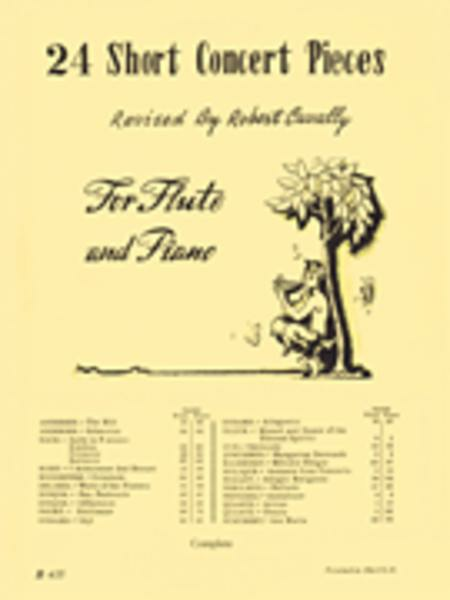 12 (Donjon); Suite for Flute, Op. 116 - Allegretto, Idylle (Godard); Pan (Pastorale) (Donjon); Orientale, Op. 31 (Boisdeffre); Suite in B minor - Rondeau, Polonaise and Badinerie (Bach); Sicilienne from Pelléas et Mélisande (Fauré); Ballade (Périlhou); Waltz of the Flowers (Delibes); Scherzino, Op. 55 No. 6 (Andersen); Adagio Religioso from Concerto for Clarinet, K. 622 (Mozart); The Mill, Op. 55 No. 4 (Andersen); Ave Maria (Schubert); Mélodie-Élégie, Op. 10 (Massanet).